The automatic lubricating oil filling equipment used PLC program control, it can feed and count the bottle, auto tare weighing automatically. This automatic lubricating oil filling equipment always used for high request of measure, such a lubricating oil, daily chemical, chemical products and high extra value liquid weighing filling machine. The lubricant oil filling machine has high degree of automation, accurate measure. Each filling head has automatic wighting feedback system. Filling volume can be adjusted uniformly or individually to make sure measure are same.Whole machine manufactured according to GWP standard request, all joints uses easy joint ways, easy to disassemble and clean.Material contact surface used 316 stainless steel, other parts are all made of 304. King Machine is Manufacturer and Suppliers in China,and specialized in providing you with automatic lubricating oil filling equipment,lubricant filling machine and so on. 1. This automatic lubricating oil filling equipment adopts PLC and touch screen control panel, so it is convenient to set. 5. 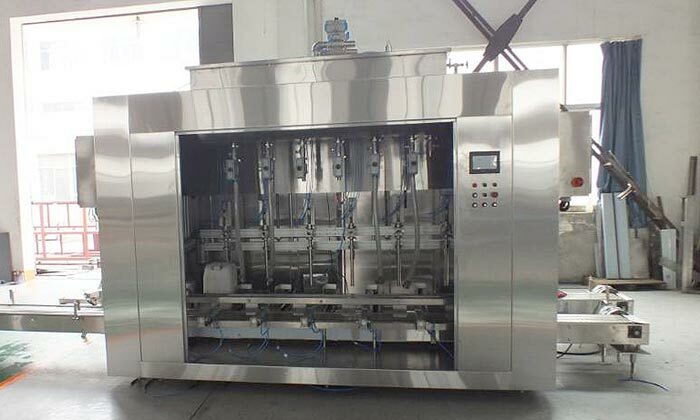 The whole lubricant filling equipment meets GMP standard, it is easy to clean and maintain, and the parts which contact with the filling material are made of high quality stainless steel. The whole machine is safe, eco-friendly and sanitary. It adapts to various kinds of working places.